Ok, so I know some people say not to wear white before Memorial Day or after Labor Day but I always do! I kind of feel like it’s a fashion rule of the past but I’m curious as to what do guys think?? White in winter (winter white) or no? Here in Portugal, wearing white jeans in winter is a sign of poverty, my mother has always said. But i love neutrals so it’s obvious that i wear them in the winter (: And white with neutral fur it’s such a cute combination, can’t wear them if not in the winter, right?! Love your outfit! LOVE your bag and your cute little family of four! What is the style name of your LV bag? I love white pants all year long! (Considering JCrew has it in their line all year). Not only that, I haven’t been arrested or given a ticket by the fashion police for the fashion faux pax! So I say- wear white jeans all year! It’s a great neutral and starting off point!? I love white in Winter! It’s definitely easier to get away with here in Western Australia because we don’t have very cold Winters, but it’s fun to break fashion rules and you look amazing! I just started wearing white jeans this winter and I love it! It gives an outfit a crisp fresh look in this frigid weather. I am glad I’m not the only one that wears white all year long. Absolutely! I just wore my white denim the other day with a long chunky sweater! I say YES to winter white! Whoever made this “rule” up had no sense of style, lol. White, just like black, in my opinion, can be worn all year round. That said, I love this entire outfit, Rach! The touch of fur really enhanced the look and I love those boots, too! Thanks for sharing and I hope you’re having a great start to your week so far! I totally need to break out my white denim for the winter. Love this look! Love the fur added to this look! Totally agree with you that the white fashion rule is a thing of the past. I grew up with it but now that I am an adult I don’t see the point. I wear white whenever it works. Great idea on the fur collar by the way. Look forward to your posts everyday! Amazing outfit, most possibly the coolest snow time outfit ever! LOVE the neutrals on you! I’m loving that fur accent collar! So cute! I totally agree! I think white jeans, a chunky sweater, and great pair of boots make for a great winter outfit! I especially love how you added the fur collar, I can’t get enough fur myself! I am a big winter white fan. I can’t give up my white denim when the weather turns cold. I think it’s a bit of an older rule that really doesn’t apply anymore. Love how you added the fur to your cardigan, very chic. 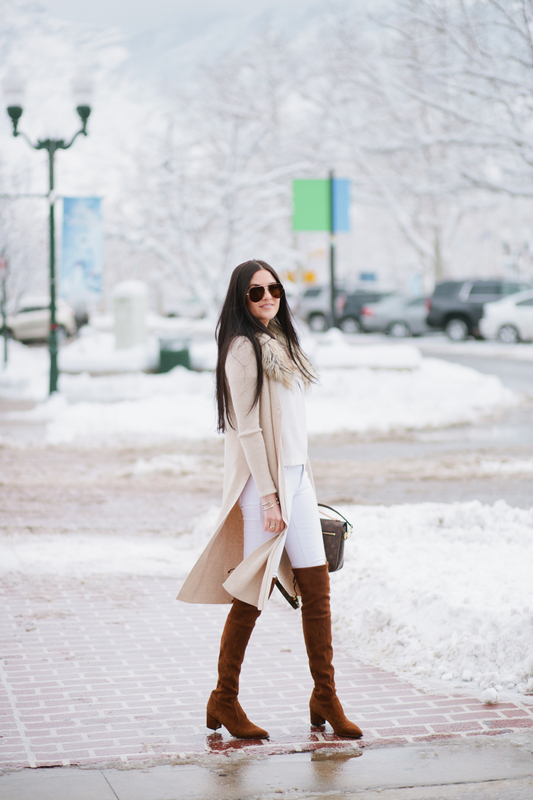 Amazing boots and loving the winter whites- one of my favorite things to wear to make the winter less depressing! Such a non-sense rule! You look fabulous in this outfit! I agree, I think the white rule is a thing of the past. I personally do not have that much that I wear in the winter but any time I see someone else wearing white I love the look! Love your boots! Love your sweater with the fur collar! YESSS to white jeans after Labor day! Love winter whites! And love how you paired that faux fur with the cardigan! I see more and more people wearing white before labor day! I love it! I love your outfit. I wouldn’t dare to wear white in such weather conditions. You are really brave. As always, I draw so much inspiration from your blog. Thank you…I love the shirt you are wearing from your own line & looked on the link at the amazing pieces you have but, no luck on the shirt. What is the name of the shirt from today’s post? Thanks so much! My all time favorite outfit from you! SO chic and I LOVE a good winter white outfit!! This neutral outfit is amazing!! I love the faux fur scarf! Love the white – not to early to wear at all. It looks great with the brown boots! But what I really love is the faux fur collar you added to the sweater! Love this coat! You look gorgeous as always! Stylish look.The all images in this blog will be pretty cool. I think wearing white during fall/winter depends on what you pair it with. These earthy neutrals are perfect. I love winter white! I think this is a great look! Those boots and pants are a winning combination! Love this look! Neutrals are definitely a favorite of mine! Being from New York I was always told absolutely no white after Labor Day but now that I’m in Orlando the “rule” definitely doesn’t apply!